If you work for a company making hockey cards, you really should be able to tell the difference between a Caps jersey and a Canadiens jersey. Last edited by Sharky94; 08-05-2016 at 12:41 AM. And yes, fairly silly of Leaf. I had originally thought that these were the actual photos of the jerseys.... but this somewhat confirms that they are just mock ups... any info @LeafGregg? Saw this yesterday clearly shows his name on the jersey but spells it wrong below. You guys are just too picky. Obviously Leaf is catering to error/oddity collectors like myself. I don't even know why Leaf bothers with alleged pics of the actual jerseys when the swatches are obviously from other jerseys. You have the Langway and Elliot posted above and Stevens in Enshrinement used pics of a Devils throwback jersey but the swatches were black. I don't hate the concept but it fails when you show a Blues jersey with a bright red swatch. I just opened a box of 2016 In The Game Used. It was a decent box. I got a triple vintage piece Leaf fans would probably like and two 2/3 patch cards. But... I don't know. I want to like Leaf, but I am not getting out of the products what I got out of ITG. It just doesn't feel like they are "All In," as the above examples show. The product seems to lack the extra mile, the Love 'n Care ITG put into the product, probably at a loss. I pulled a Matt Murray Game-Used Memorabilia Patch. The card has the back of Murray's Penguins jersey on it and a patch piece from what looks like his Junior team. I'd prefer a picture of Murray himself in his Junior uniform. The Triple Patch card is a little better, although I have no idea where Nabokov's red, white and blue patch (or more like silkscreen piece) came from. It doesn't seem like it would be from the pictured Sharks Jersey. It seems like Leaf relies a lot on jersey pictures. I know ITG did some of that too, but not that often. Maybe it's harder to nail down licenses with individual players these days, compared to when ITG was in business. Or maybe ITG just went the extra mile to get as many of those licenses as they could. I don't know. You would think if Leaf is going to put a jersey picture on the card, they would match up the memorabilia with it, unless the pieces are just randomly selected from the player inventory, not so much the teams. It feels very mainstream Upper Deck (not a diss, but we know UD jersey cards and swatches don't always match up). Smaller companies need to be better than the bigs. There is some damage on one card, but I don't even care that much. Again, it wasn't a bad box, but I just felt underwhelmed even before I opened it. Opening it did not change my feeling. 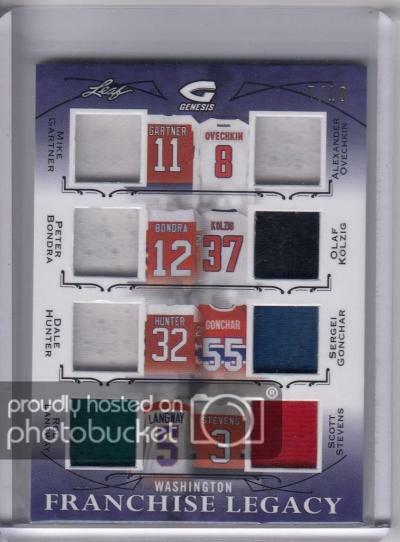 Almost as bad as UD's Rookie Jersey mix-ups in Black Diamond. This is what happens when you have the cards being made by companies in parts of the USA that know very little about Hockey. They all should have stuck to Bouncy Ball Cards. They are notoriously bad with Patrick Roy. They obviously have both a Habs and an Avs jersey, but they continue to mix and match the jersey and picture. That sort of thing drives me nuts. They can't seem to get Lafleur's Habs and Rangers jerseys straight either, but at least they're the same colours. Looking for rare guy lafleur items, and HOF game used nameplates.